A man was struck and killed by a tour bus this morning in Center City right in front of police headquarters. It happened at 9:47 a.m. at the intersection of North Franklin and Race streets. The 46-year-old pedestrian was crossing the street when the white tour bus turned the corner and hit the man. The bus dragged him for 50 feet and did not stop. The victim was taken to Hahnemann University Hospital where he was pronounced dead. He has been identified as Joseph Heard. The incident was captured on surveillance cameras outside police headquarters. 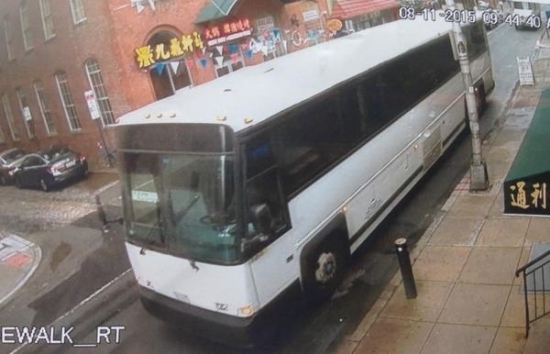 Investigators were able to determine the bus company who then contacted the driver while on his way to Washington, DC and rerouted him back to Philadelphia. Police are examining the bus and questioning the driver. It is possible he did not know that he hit anything. It is not known if there were any passengers on the bus. Authorities are asking for any eyewitnesses to come forward and provide additional information about the incident. The National Transportation Safety Board (NTSB) has released it's findings on the June 7, 2014 crash on the New Jersey Turnpike that severely injured comedian Tracy Morgan and killed James "Jimmy Mack" McNair. They found that the driver of a Wal-Mart truck could have prevented the accident if he had slowed down to the posted 45 mph speed limit in the construction zone. Kevin Roper of Jonesboro, Georgia, was traveling at 65 mph instead and was slow to react to the stopped traffic. The NTSB also cited driver fatigue as a cause. Roper had been awake for 28 hours at the time of the accident. The board did say that the failure of Morgan and others in the limo van to properly wear seatbelts contributed to the severity of their injuries. They also found fault in the first responders who were mostly volunteers. Pennsylvania Attorney General Kathleen Kane's top aide, security chief, and driver pled not guilty to a contempt of court charge today at his arraignment in Montgomery County court. 47-year-old Patrick Reese has been charged with looking into grand jury files and searching the Attorney General office's email system for information about the investigation into Kane which violated a judge's order. Reese left his position as the police chief of Dunmore, PA near Scranton to become a supervisory special agent in charge of Kane's security detail. He was also her chief driver and people in the AG's office referred to him as her “chief of staff.” Reese was released on $5,000 unsecured bond. His next court date is September 9th.